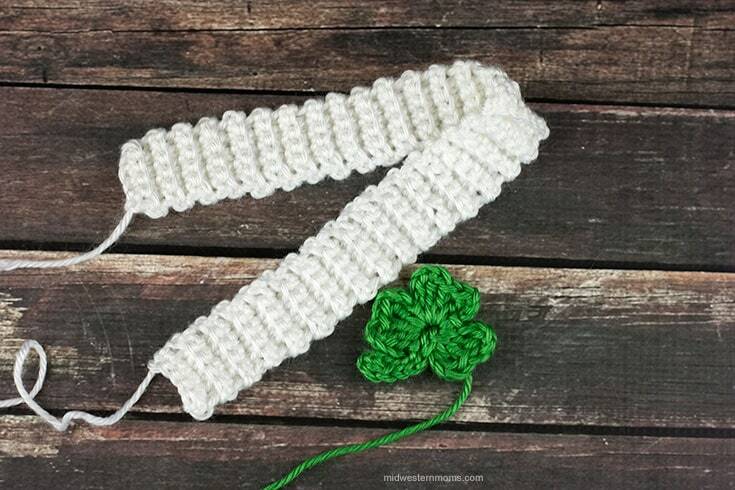 A simple crochet headband pattern perfect for St. Patrick’s Day! This Crochet Shamrock Headband pattern is easy to make and is a quick project! If you are looking for a bit o’ luck for this St. Patrick’s Day, you found the pot of gold! 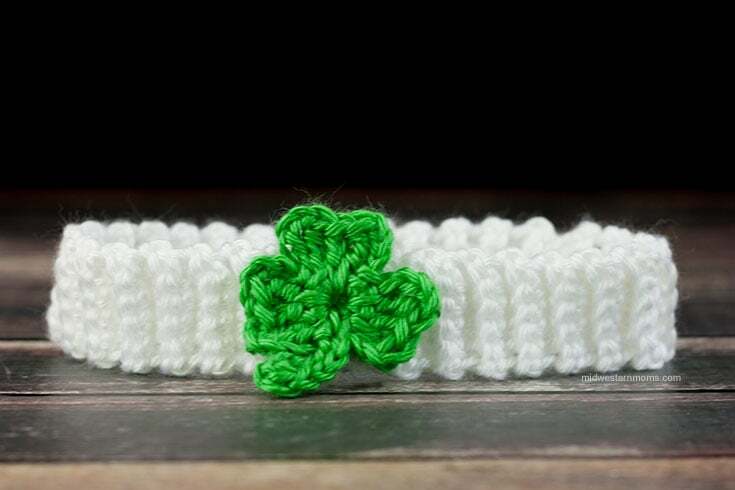 This crochet shamrock headband pattern is the perfect St. Patrick’s Day accessory. The headband pictured is a newborn sized headband. So the total length before sewing the ends together is 13 inches. I will list below the measurements for different ages so you can adjust the pattern for the size you need. 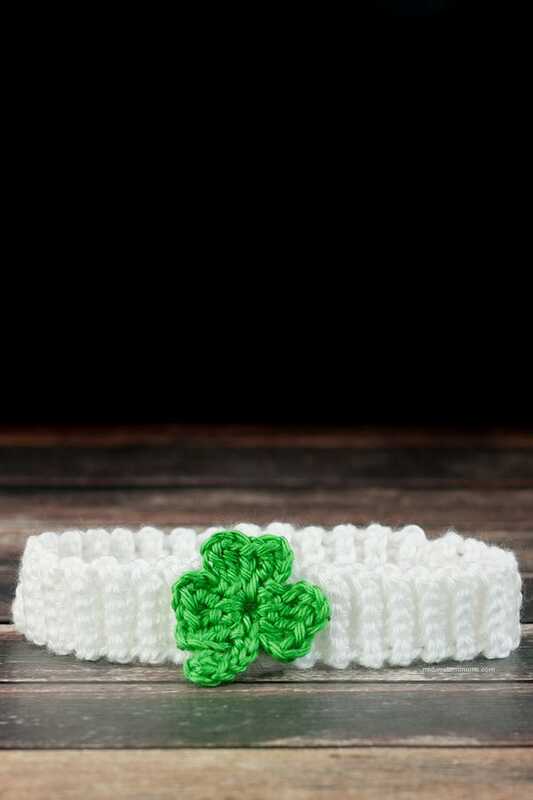 Once you have the pieces made, you just need to sew the headband together to make a circle and use the green yarn to sew the shamrock onto the headband. If you are a visual person and would like to watch a video, I have placed a video below from my Crochet Shamrock Post. Can’t find the supplies you need at the store? I like to order from Amazon since I am a Prime member. I get my supplies in 2 days with free shipping. Not a prime member? Try Amazon Prime 30-Day Free Trial ! Chain 4, Slip Stitch into your first chain. *Chain 4. Triple Crochet; Double Crochet; Triple Crochet all into the center of the circle. Chain 4, Slip Stitch into the center. * This makes one petal. Repeat from * to * for a total of 3 petals. Chain 7. Half Double Crochet into the 3rd chain from your hook. Slip Stitch into the remaining chains. Add a final slip stitch into the center of the shamrock. Leave a long tail when you cut your yarn. You will use this to sew the shamrock onto the band. Row 1: Chain 6. Single Crochet into the second stitch from the hook. Single crochet across for a total of 5 single crochets. Turn your work. Row 2: Chain 1. Single Crochet into the back loops only and single crochet across for a total of 5 stitches. Turn your work. Repeat Row 2 until you have 65 rows total or till you have the desired length for your headband. Cut your yarn but leave a long tail to allow you to sew the 2 ends of the headband together. If you are wanting to be able to print this pattern, enter your email in the newsletter box below. You will be subscribed to Midwestern Moms’ newsletter. This will also send you an email with a link to be able to print the Crochet Shamrock Headband Pattern. Did you put your email in the newsletter box and get the email?